Sold in June 2016, the 37.44 metre Sanlorenzo superyacht Anastasia M is back on the market, renamed Kaos and listed for sale by Wes Sanford at Northrop & Johnson. Designed by Francesco Paszkowski, Kaos was built in GRP by Italian yard Sanlorenzo to RINA class and delivered in 2010 as the third hull in the SD122 series. Her serene interior features pear and beech wood paneling contrasting with mahogany parquet flooring, while in 2017 she received a full repaint, giving her a new grey hull. She has accommodation for eight guests split across four cabins — these consist of a main deck master suite, two VIP suites and a twin cabin with a Pullman berth, all with full en suite facilities. The main deck of this yacht for sale houses a capacious saloon with an adjoining formal dining room. There are extensive deck spaces, including an aft cockpit for al fresco dining, a large upper deck with a sky lounge fitted with comfortable seating and an entertainment centre, and a flybridge that comes with a small swimming pool, bar and sun pads. 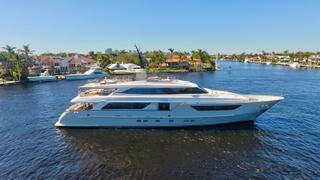 Lying in Fort Lauderdale, Florida, Kaos is asking €8,750,000.